Fernando Gaviria became only the second rider this century to win multiple stages at the Giro d'Italia before turning 23. It happened Wednesday afternoon, in Messina, which was visited by the race for the first time since 1999, and it was a success that came following a sublime ride of the entire Quick-Step Floors team, who moved to the head of proceedings from the start of the stage, in Pedara, controlling the escapees' advantage and bringing them back with 15 kilometers remaining, before guiding the Colombian to another memorable win, the squad's 26th of the season. Before it all came down to the expected bunch gallop, Fernando Gaviria scored valuable points at the day's both intermediate sprints, behind the two breakaway riders, moving into the virtual lead of the ciclamino rankings. 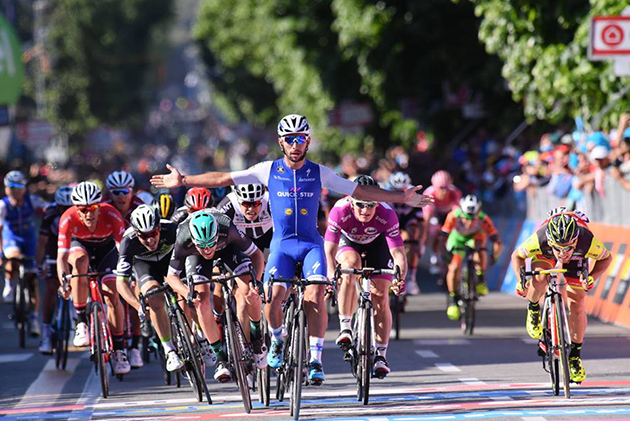 Once things heated up right before the sprint, Quick-Step Floors remained focused and attentive, coming to the front inside the final kilometer, thanks to a mammoth effort of Grand Tour rookie Davide Martinelli, who upped the pace at the right moment, opening the way for Maximiliano Richeze and Gaviria. The Argentinean's huge experience, calm and tactical nous proved crucial in the team's second success in three days. Sam Bennett (Bora-Hansgrohe) was the first to launch the sprint, but Gaviria remained patient after Max clipped off the front and it was only with 150 meters remaining that he opted to go and put his fast legs to work, taking a clear victory by more than a bike's length in front of his family and friends from Colombia. "The finish was pretty hectic, but I was calm at all times, thanks to the excellent job of the guys. Davide pulled hard at the front to bring us in a good position, then Max was outstanding in guiding me through the closing meters. I'm happy with my two victories and with the way I feel. This win is not only for me, but also for my family and team, who have always supported me", said Fernando Gaviria, who now holds a commanding lead in the points classification. The 22-year-old Colombian, who already has six wins to his name this season, talked at the press conference also about the key moments which make the difference in a bunch gallop: "When you sprint, it's always a question of instinct. You need to navigate through the peloton, to find the best wheel and also to have luck on your side. Choosing the right moment to sprint is like choosing the right moment to attack." Bob Jungels finished safely in the peloton, thus retaining the maglia rosa, which today celebrated 86 years since it was introduced in the Giro d'Italia, and was all smiles after the last stage in Sicily: "I am happy to spend at least one more day in the pink jersey and it would be very nice to keep it until Sunday, when we'll climb Blockhaus. But, at the same time, it's true that the stages leading to that one are also important, and we must pay attention to the other contenders. We'll see what will happen over the next days, but what I can tell you is that I am very motivated." Yesterday, Frederik Frison was involved in the big crash at Les 4 Jours de Dunkerque. Further tests yesterday evening and this morning showed that Frederik doesn’t only have a fractured pelvis. He has several severe injuries. Frederik has multiple pelvic fractures and it will take time and a lot of rest for this to heal. New scans showed that his chest intercepted a big part of the crash. On the left, Frederik has three broken ribs and two fractures to the transverse process on his vertebrae. Further examination also showed he has a small pneumothorax. Frederik doesn’t need to undergo surgery. The second stage at Dunkerque, with start and finish in Saint-Quentin, was 169 kilometres long. Just like yesterday a break was established early. Five escapees got a maximum advantage of eight minutes, but were caught in the last kilometres without too much trouble. Jens Debusschere got beaten in the sprint by Arnaud Démare, but Jens remains GC leader. Marc Sarreau is second at ten seconds. At the Giro a short sprint stage of 159 kilometres was scheduled, from Pedara to Messina. The teams of the sprinters had their sight on a bunch sprint so a two-man break had no chance to survive. Lotto Soudal with Bart De Clercq and an Orica-Scott rider helped Quick-Step Floors to control the race. Lotto Soudal and Quick-Step Floors fiercely increased the pace going into the last five kilometres. André Greipel lost the wheel of his teammates in the penultimate kilometre and had to start the sprint from too far behind. Greipel finished fourth, Fernando Gaviria won the sprint and takes over the points jersey from Greipel. André Greipel: “The team prepared the sprint perfectly. We came to the front of the bunch at the right time. Tomasz Marczynski did a very strong turn just before the roundabout on the local circuit. Unfortunately I lost too many places on the roundabout and had to start my sprint way too early. There are still some opportunities in the Giro, but I don't know if tomorrow is one of them. We will have to wait and see how the race will unfold." The Amgen Breakaway from Heart Disease Women's Race empowered with SRAM is a four day stage race, held in Northern California. Similar to the previous two years, the race starts with a stage around Lake Tahoe. This is followed by a hilly second stage, with a flat run into Sacramento for stage three. Both Team Sunweb's men and women programs will race alongside each other for the final circuit stage around Sacramento. 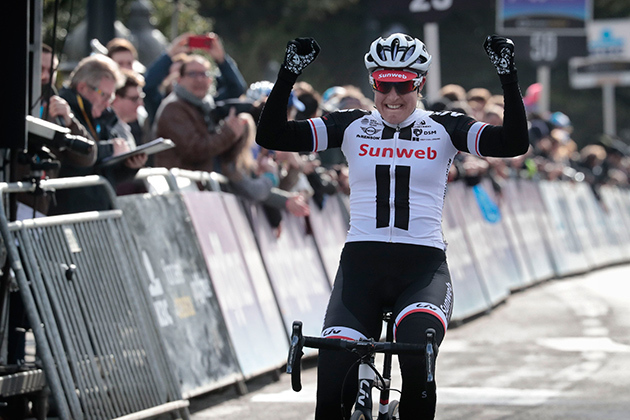 With Leah Kirchmann (CAN) winning two stages at the race in 2015, Team Sunweb will have an experienced roster lining up for the 2017 edition of the race. Ahead of the race Team Sunweb coach Hans Timmermans (NED) said: "This is the first experience of racing in the USA for our women's team. After a strong performance in Yorkshire we start with another solid squad in South Lake Tahoe. The first two stages are quite challenging, with a lot of climbing. With Coryn we have a rider that likes an uphill finish and the first stage really suits her strengths. Leah won two stages here in 2015 so is a strong rider on these parcours. Our team captain Lucinda returns to racing after a rest period and she will also be an important factor within the team's race strategy. For the final two stages we can expect a bunch sprint and whilst riding on home soil, Coryn is eager to perform here. We also line-up with our two youngsters Liane and Juliette and after some good racing over the past few months it will be good to see how they get on in the climbing stages. The competition is really tough this year so anything is possible." In its 12th edition, the Amgen Tour of California makes the jump to the WorldTour program for 2017. Starting on May 14, the first stage is set to be a day for the sprinters with a fast finish in Sacramento. Day two moves to the mountains with six climbs and an uphill finish to contend with, similar to the finish of day three. Another bunch sprint comes on stage four, followed by a gruelling climb to the finish of the Queen stage on day five. The race is closed by a 15 mile individual time trial set to decide the overall standings. Speaking about the race, coach Marc Reef (NED) explained: "As the only WorldTour race in the USA, it is set to have some huge crowds and brilliant atmosphere this year. There are some really difficult stages with challenging finales, providing opportunities for the sprinters and climbers. We bring a young team with a wealth of talent to California and both Roy and Johannes will be important in guiding them. It will be good to see how it goes there at altitude and for many of us it will be a valuable experience." Forming part of the UCI Europe Tour, Grand Prix Criquielion is an annual event that takes place in and around the Belgian village of Deux-Acren. Along its 173 kilometre route, riders will have a multitude of climbs to contend with before a flat run in to an expected fast finish. Team Sunweb coach Tom Veelers (NED) explained: "We line up at Grand Prix Criquielion after our Development program's mid-season meeting. In this meeting we evaluated our progress so far, as a team and as individual riders. The team and each rider now have specific points to focus on over the coming races, and this race gives us the first opportunity to implement what we have talked about and what the guys have learned. Following this meeting the morale in the whole team is high and everyone is super motivated for a good race."